Rate of return of is one of the three most important factors that determine how much money you make investing. The other two are your expenses and your risk of loss, which are both closely related to rate of return. In our previous post, we discussed compound interest and how earning interest on your interest is the most powerful force you have to grow your investment portfolio. We showed how 10% and a 100% rate of return investment could grow. The two were very different. Now, we’re going to dive deeper into how small changes in rate of return will effect your portfolio. The purpose of this post is to show how small changes in return cause large changes in portfolio value over time. We’ll demonstrate the growth of a portfolio using both nominal and inflation adjusted rates of return. This post will consist almost entirely of these two examples, because the concept of rate of return is best understood with visuals. As you can see there are very large differences in portfolio value for just a single percentage point change in the rate of return of your investments. When at 10% rate, a 1% increase equates to nearly a $20,000 larger portfolio. While a 1% decrease equates to nearly a $14,000 lower portfolio. It is important to remember that the original investment was only $1,000. This means that for every $1,000 that you invest at a 10% rate of return now, will be worth over $45,000 in 40 years. That’s 45x the original investment. Think about what that means. If you could invest $10,000 today, you could end up with $450,000 in 40 years with no additional investment. This demonstrates how important it is to begin investing as early as possible, because time is your greatest asset in harnessing exponential growth. If you’re older, it doesn’t mean that you can’t benefit from this compounding effect, it just means that it is ever more urgent to begin as soon as possible. It’s never too late to get started. I also want to draw your attention to the 2% rate of return category. In 40 years, the original investment of $1,000 only grew about 2.2x to $2,208.04. While you might look at this and say well, at least we made gains, you actually lost money once you take into account inflation. This is particularly worrying because the bond market right now is predicting only about 2% nominal returns over the next few decades. Everyone looking for safety in bonds could be seriously in trouble if things go badly. Let’s take a further look at how inflation affects all of the rates of return in my next example. In this example we examine how inflation can distort otherwise good looking investments into bad investments. Inflation is also the reason why you must be careful to require a certain level of rate of return when making your investment decisions, so that you actually end up ahead and not behind. So how has inflation effected our portfolio values? The first thing comparison you could make is that the 12% nominal rate of return is now worth much less than the first example showed. 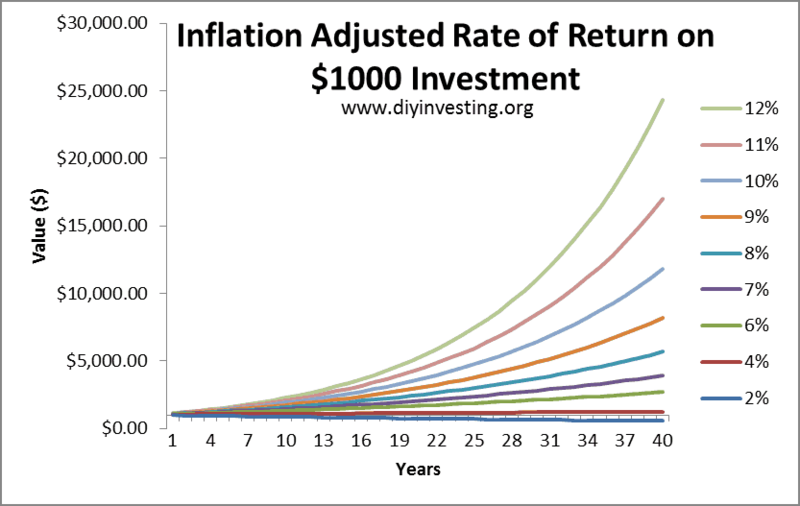 In the first case, 12% returns with no inflation was worth over $93,000 after 40 years. Now it is worth only $24,324.69. This $24,324.69 is a real return of 8.5%. (12% nominal – 3.5% inflation = 8.5% real) You would produce the same value if you plugged 8.5% rate of return into the first graph, where the numbers weren’t inflation adjusted. The important takeaway is that inflation drastically reduces the value of your gains in your portfolio. The difference between my example and real life is that you won’t be given a chart to see the difference. All you will see is the first chart of your gains without inflation taken into account. Meanwhile, the prices of all of the stuff you buy will be going up. What’s happening is that your portfolio will look like the first graph, but your actual ability to buy stuff with it, will match the second graph. This concept is called purchasing power. How much stuff can you purchase with your money, not just how large the numbers appear. The other takeaway you can probably gather from this chart is that the 2% value is actually lower than the starting $1,000. In order to explain this more, I want to show you another chart. This graph uses all of the same assumptions as the graph before it. We are just looking at a zoomed in subset of the overall data. The key thing to point out from this graph is that as time goes on, the 2% rate of return is actually losing value over time. Remember, all three investments began at $1,000. By the end of the 40-year time horizon, the 2% rate of return is left with only $557.69 of purchasing power. This is the effect of inflation at work on your portfolio. Inflation most clearly effects the lowest rates of return, but reduces the value of returns at all levels. Rate of return can make a massive difference in your wealth. In the first example, I showed that a 2% rate of return would provide just over $2,000 from an original $1,000 investment over the course of 40 years. This is before taking into account inflation. However, if you were able to have a 20% rate of return on that $1,000 initial investment, you would have over $1.4 million by the end of the 40 years. That is a significant difference. I didn’t show the 20% rate of return on my graph, simply because it would have made it hard to see the other lines. The key takeaway from the first example is that your rate of return matters. It is the source of all of your investment gains, and makes a significant difference in your wealth. You should always look to do what you can to increase your expected rate of return, so long as you don’t increase your guaranteed expenses or risk of loss at the same time. The effects are magnified even greater at the higher rates of return due to the effects of compound interest. The key takeaway from the second example is that inflation is an invisible force which slowly erodes the purchasing power of your investments. In order to not lose money over time, your investments need to achieve a rate of return higher than the rate of inflation. Ideally, you will achieve a rate of return much higher than the rate of inflation. Do you have a specific rate of return that you use to plan your investments? Is there something you can add to the discussion or something that I missed? Please take the time to comment below, and we’ll all benefit. Was this content helpful to you? Consider sharing it with your friends. We have easy to use social media buttons just below this article to make it simple for you to share. ¹I realize that the currently stated inflation rate by the US Government is much lower than 3.5%. However, I choose to continue to use 3.5% because our current inflation rates are artificially held down, and it is unlikely that this can continue for the extended period of your entire investing lifetime. Using a higher inflation rate is a conservative estimate, and will only mean you end up better off than you expect, if the average inflation rate turns out to be lower. ²Nominal = without inflation, Real = Inflation adjusted. The percentages shown in the graphs are all nominal rates of return.